Dynaflex® Tru-Seal® Band Clamp (Flat Style). 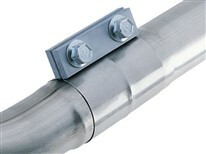 Flat, wide band provides even clamping force. Made from T-304 Stainless steel. Allows connections to easily be disassembled. 3” wide band. Natural mill finish. Can be brushed or polished prior to installation. THESE ARE MADE IN THE WHS. DO NOT MAKE PACKETS.